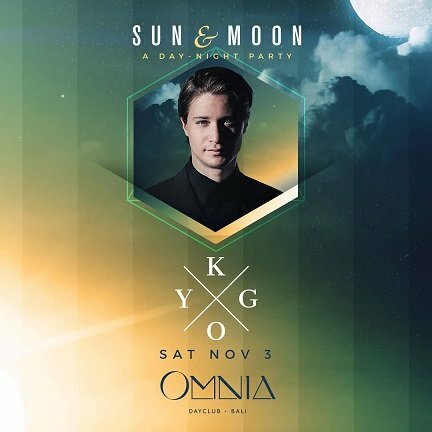 Kyrre Gørvell-Dahll, or better known by his stage name KYGO is set to headline the 3rd edition of Sun & Moon (a day to night party) at OMNIA Bali on Saturday 3 November 2018. Bringing his trademark sound to the soaring cliffs of Uluwatu, KYGO x OMNIA Bali is the perfect match of sonic & visual landscapes coming together in perfect harmony, join us to experience the beautiful productions of KYGO in the most stunning day club environment in Asia. The award-winning Norwegian artist first gained international attention through his remix of Ed Sheeran’s great single, I See Fire. One of Kygo’s singles, “Firestone”, was nominated for the song of the year award during the prestigious 2016 Spellemannprisen (Norwegian Grammy Awards). Don’t miss this edition of OMNIA Bali’s unique Sun & Moon party series. A day to night party you are encouraged to arrive early, take in the soaring sunshine, unwind in our infinity pool with epic views across the Indian ocean and as day turns to night hit the dancefloor for special up close and personal sets from a selection of the world’s leading DJs. Embrace this unique party & experience at the most stunning day life destination venue in Asia.